Lloyd’s Register one of the world’s larg- wonder many companies are getting and that it will be the next step on the natural instead of looking at a screen. est ship classi? cation societies, holds a excited about its potential. industry’s digitalization journey. 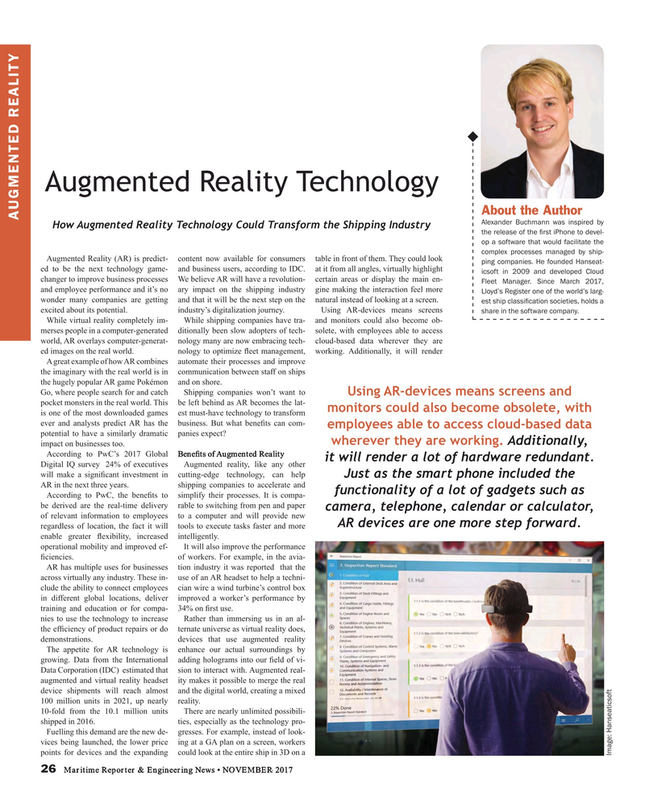 Using AR-devices means screens share in the software company. A great example of how AR combines automate their processes and improve the imaginary with the real world is in communication between staff on ships the hugely popular AR game Pokémon and on shore. Using AR-devices means screens and pocket monsters in the real world. This be left behind as AR becomes the lat- monitors could also become obsolete, with is one of the most downloaded games est must-have technology to transform ever and analysts predict AR has the business. But what bene? ts can com- employees able to access cloud-based data potential to have a similarly dramatic panies expect? wherever they are working. Additionally, impact on businesses too. According to PwC’s 2017 Global Bene? ts of Augmented Reality it will render a lot of hardware redundant. AR devices are one more step forward. Data Corporation (IDC) estimated that sion to interact with. Augmented real- augmented and virtual reality headset ity makes it possible to merge the real device shipments will reach almost and the digital world, creating a mixed 100 million units in 2021, up nearly reality.